I hope everyone had a great Christmas. I can’t believe another year has gone by, where does time go?? I think the older we get, the faster time seems to slip away. 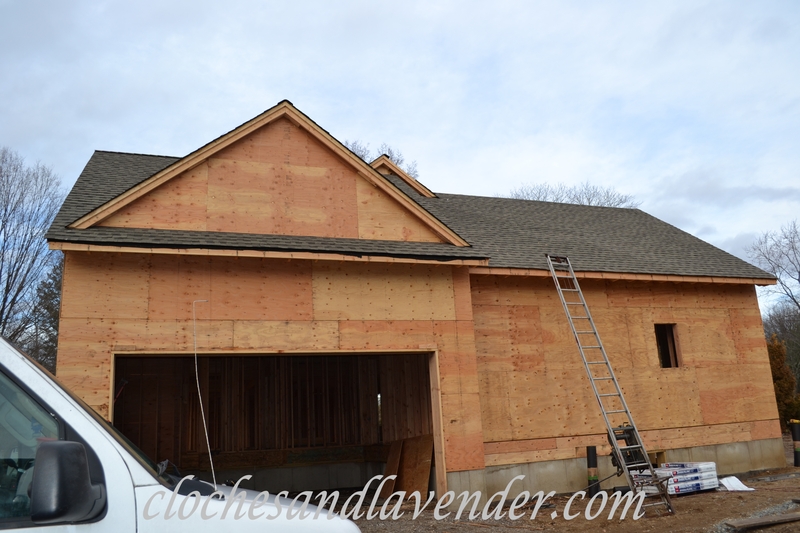 As of today, our shingles are nearly finished on the roof too!! (we selected “weathered wood” from GAF). The back side should be all done by tomorrow. Our builder Gerry, is trying to get the house closed up as fast as possible. Being this is NJ and it is winter we are working with weather and you know what that means, SNOW!!! 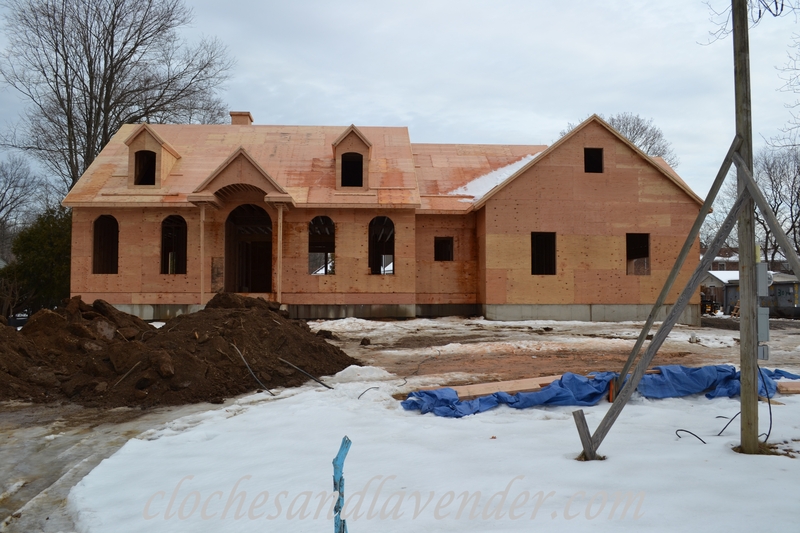 Our windows are supposed too arrive tomorrow and they will be installed along with the house wrap after New Year’s day. Now remember I said we are working with the weather, of course , it is supposed to snow on Thursday, so if it snows then hopefully Friday. Gerry has told us many times, we have no time to stop. If it snows we shovel and work. He is such a great guy. Decisions, the kitchen has started getting planned. The man we are dealing with is Rich and what a great guy. He gave us some great ideas and tweaked things a bit in the plan. We may have another meeting Saturday. Many of you know I have been chomping at the bit to get started with the décor and it is HERE and HAPPENING!!!! I will give you more news on the kitchen when the plan is final. Let me just say, so EXCITED!!! I want to wish everyone a very Happy, healthy and safe New Year! To everyone that follows me religiously, thank you so much for hanging in there with me. I have learned many things during some of this down time. 2014 will be a GREAT year so stay tuned!!!! It’s looking good, Cynthia! Fingers crossed they can go ahead as scheduled with your windows and wrap. I love your front door area and the shape of the window openings. It is going to look so great! I’m sure you are saving pictures of what you’d like to do inside for when that time arrives. It won’t be long now! It’s supposed to start snowing late Thursday so fingers crossed. Believe it or not I’m just going with what I know I love and have in my head. We are hoping the weather isn’t to bad. It is getting so fun and exciting now. Stay tuned. Happy New Year, friend! Your home is looking lovely, Cynthia! I love the arched window openings and the dormers in the front. We’ve got the same portico over the front door of our 1921 house! What an exciting time for you. Enjoy every minute and have a Happy New Year! Thanks so much Vickie. It is really getting exciting. Happy New Year and a Healthy one. Stay tuned friend. Your home is lovely! I have my fingers crossed that you can get your windows installed and house wrapped before any weather! It has great curb appeal! I know this is an exciting time! Happy New Year! It’s beautiful Cynthia! I really like the idea of the home looking like a two story. Fingers crossed Mother Nature cooperates. Oh Doreen that is why we did it. We like the look too. Thanks for always supporting me. More and more details will be coming. Happy Healthy New Year dear friend!!! The perfect Christmas gift – here’s to a happy and healthy 2014 in your fabulous new home! Kelly thanks for always being here. Happy New Year to you and your family with good health also!!! OK….soooo YOUR HOUSE IS DARLING! What a cute style…like a cape cottage. I am curious to see your kitchen and find out what wood/color you go with. I am excited right along with you!!!! I used to work for a builder and LOVE watching homes come together! What is your flooring? Sorry…I am totally “nosey” with house stuff. You are never nosey Holly. I love that you are so into this too. We haven’t decided totally yet on the floors. Something a little dark but not too dark and they are oak. The kitchen has to be finalized and I will go into more detail then. FUN!!!! Happy New Year! How exciting! The house is looking really good…. I know it’s going to be beautiful. Thanks Sharon. It gets more exciting every week. Happy New Year!! I’m so happy for you, Cynthia! Your house is looking wonderful. I’m sooooo ready to move to one-floor-living. I can’t wait to hear more about the plans for your kitchen. Happy New Year to you and your family! Suzy thanks so much for your support always. Have a Happy Healthy New Year. it’s beautiful, cynthia! have fun planning the kitchen! happy 2014! Thanks Lynn for all your support. 2014 will be great. Happy New Year!!! The house looks fantastic! Looking forward to seeing how it shapes up! Happy New Year! It is getting exciting. Thanks for your visit. Happy New Year!!! Cynthia, Love how your house is coming along, the design looks awesome. I would love a one story, I’m so jealous! Wishing you and your family a Happy New Year!! Looking forward to 2014 and your inspiring ideas in your new home!! Judy thank you so much. We are getting more excited every day. More and more things happen every day. I’ll have updates soon. Have a Happy and healthy new year friend!! Well, OF COURSE you’re excited…and with every good reason!!! This is really coming along! I know it must be really cool to watch this dream coming true right before your very eyes! And what great people it sounds like you’re working with to get the job done right! Congratulations, and Happy New Year! I hope 2014 is the BEST for you!!! Alycia, thanks so much my girl. We will have more details soon about our kitchen. It is so exciting now. I want to wish you a very Happy and Healthy New Year!!!! Can’t wait to see what you will be up to. How exciting. Your house is just beautiful and I know you cannot wait until it is finished. It will be well worth the wait. We just finished remodeling and adding on to our kitchen. Happy New Year to you. Have a Happy Healthy New Year!!! Your house is gorgeous already, Cynthia. I love, love, love the side garage. (No gigantic garage door viewed from the front.) 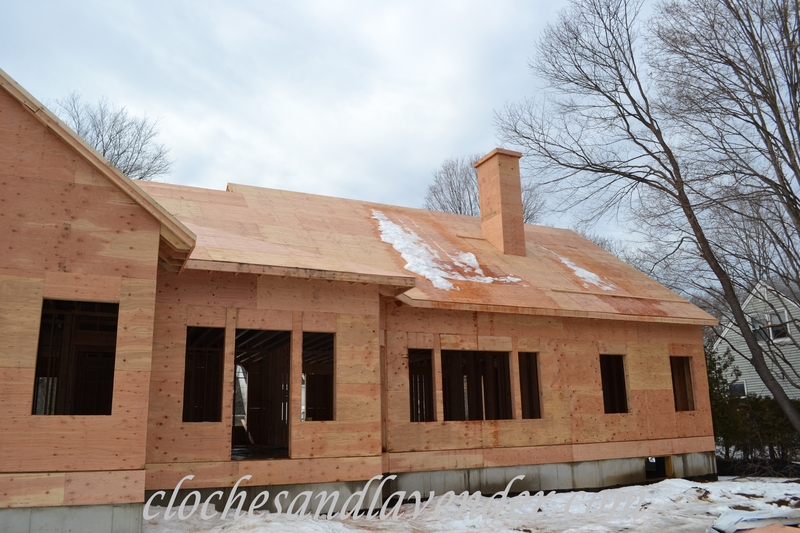 The dormers are so sweet, and it does look like a two story home. So excited for you. Happy New Year!! Thanks so much Laurel, we are so happy with it. When the kitchen decisions are final I’ll let everyone know some details. Happy New Year friend! Thanks so much!!! When the details are nailed down I ill speak more about the kitchen a bit. OG! It looks awesome!! Can’t believe it’s up already! You must be so excited. And now the real fun begins as you choose finishes and colours. Wow, wow, wow!! Thanks so much Heather. I am beyond excited. We started the kitchen and I am trying to make the decisions that are us and not the trend. We have to get it finalized and once e do I will talk about that. You are a great friend!! Your house is coming along nicely! I like the look of it. I prefer for the house to look like it has an upper level too. It just adds more character. I feel sorry for the workers having to be outside in the cold building a house. I guess that just comes with the job though. At least you won’t have it delayed then! I know this new year will bring you exciting things. It does add more character and that is what we are about. Thanks so much for your support Kelly. I feel bad for the workers too but I guess they are used t o it to a certain extent. 2014 will be very exciting for us! That is going to be one beautiful house. Congratulations on your progress. I bet you can’t wait to see the final results. No I can’t and now the fun is beginning we are starting to choose our kitchen!!! Happy New Year Maggie!!! Looking so good, Cynthia!!! I can just imagine the fun you’re having designing a new kitchen! Oh, let’s hope the weather cooperates. I’m sure you had a lot of snow yesterday along with many in the northeast. We did have snow last nigh but not as bad as we thought. I spoke to the builder yesterday and our windows should go in early next week. I am taking my time with the kitchen. I want to make smart choices for us not just get what everyone else has so I can say I have what everyone else likes. We have to finalize it and then I will tell some things. Thanks Sonya, I am getting so excited now. We just need the weather to cooperate so they can get the house closed up. Keeping our fingers crossed because then it is smooth sailing. Making kitchen decisions now!! I love the two story look of the house. Does that means you will have tall ceilings? Our foyer will be 10′ and the rest of the house 9′. We didn’t want to have the expense of a very tall ceiling in this house. Our other home had 22′ foot ceilings in our great room. The rest was 9′. I just feel so lucky that I get to build a brand new home for the second time!!!! Thanks Susan and I can’t wait to share more. Happy 2014 to you too!!! It’s looking good! I’m sure you’re super excited about the design and décor…I know I would be!! I’m looking forward to seeing the progress and completion of it! I am so Excited and I am enjoying it so far. I can’t wait to share more details. How exciting for you! It looks like it’s going to be a beautiful home. I can’t wait to see what you have planned for the kitchen! Thank you so much. We are down sizing and made it one level for me. I have MS and don’t walk great. Hey at least I can walk though. I can’t wait to finalize the kitchen, then I will give “some” details! Well it is starting to look great..and I am sure you are way too excited about finally starting the decor decisions!…Hope the snow has not put you too far behind! So far we are behind one or two days, not bad, considering. The windows are starting to go in tomorrow or Thursday and some one Monday and Tuesday, they were backordered and the front door goes on so there will be updates very soon. In planning stages for the kitchen too!!! Thanks Cindy so much!!! I am so glad you are following me back. Stick around the fun parts are starting! How exciting to finally see things moving along!!!!! 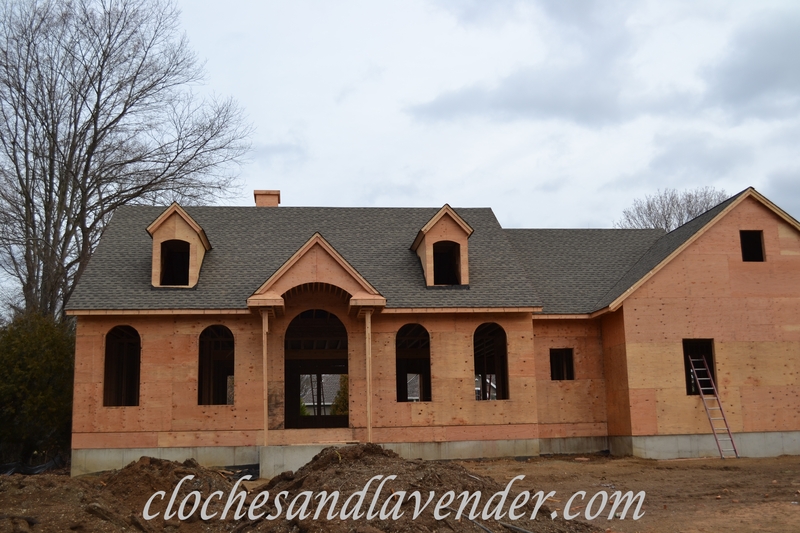 I love the dormers…..it is a gorgeous home!!! Thanks Des, we really wanted them. We think it gives it more character. If someone wants down the road they can finish the space and it will be over a 4,000 ft. colonial. Cynthia, I love it! Oh sweetie I can see the potential already. The windows are great! It just looks so, so gorgeous! I’m so excited for you and can’t wait to see more! Thanks so much Jann. I will be posting updates soon!!! Your home is going to be beautiful!! I love the style. Hope the weather starts to cooperate for you and your builder. Happy New Year! Penny I am so sorry for not responding sooner. This was in my spam and I don’t know why. Thank you so much for your visit. I wish the weather would start behaving but winter in NJ this year is awful. I love the style of your new home! I hope the weather cooperates for you and your builder. Happy New Year! Penny thanks so much and things are progressing. Wow your new home is looking gorgeous Cynthia! Dee, thanks so much and I am glad you stopped over. I haven’t heard from you in a while. Hope things a ok.
Congratulations on getting your new home started and in the dry. Building a new home is great, fun and yet a lot of work, coordinating, buying, checking, picking out everything, etc. but fun too. Your home is looking good! My wife and I built 4 homes in our time together – over 30 years. Our last home which we plan to retire we finished 3 years ago. I found your site from another site and glad I did, I enjoyed visiting your site!! Thanks Michal and I hope you will follow along. Your home is coming along beautifully!!!! Such an exciting time! It is remarkable that we are already so far into January. I hope all is well with you! Hi Kenely, I hope everything is ok. You haven’t posted in a while. I am just getting ready to write a post with updates. Everything is going well. Took a longer holiday “break” than originally intended in order to get some things organized on the home front and get ready for a new year of Green Door Hospitality. Beginning posts again today. Looking forward to reading your updates! Happy to hear everything is ok and I am looking forward to your posts! So exciting!!! and it looks fabulous already!